Every occupation has its tools. Without them to help, it may be difficult to complete jobs efficiently. When it comes to electrical services, tools are everything. A professional electrician cannot do much without some essential items in his arsenal. Yes, it may not be possible to invest in so many tools at once, but experience usually teaches a contractor which tools are more important. Regardless of if you are an electrical technician or a homeowner trying to learn the basics for small household projects, you need to invest in quality electrical equipment. They always make the job easier and safe. 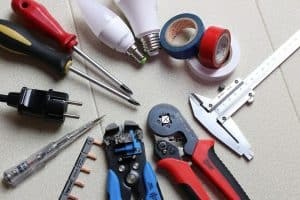 Professionals have different opinions on what they classify as the best electrical tools, but from our expertise, here are the items you are sure to find in each list. A pair or more of sturdy pliers is a must-have electrical tool. Pliers come in handy for twisting, manipulating, and cutting wires. Since most electrical projects involve wires, it is important to stock a few. The various pliers include side-cutting pliers, needle-nosed pliers, crimping pliers, and insulated pliers. The pliers should offer a comfortable grip, be properly insulated, and work smoothly. If you don’t own a quality set of screwdrivers, then you own nothing for electrical services. Right next to pliers, screwdrivers are essential tools for any project. Screwdrivers perform functions such as fastening, loosening, and reaching awkward places. A screwdriver set would come with a variety of head shapes and sizes. You should also include a voltage tester screwdriver to your toolbox for checking live current. It may not come with the screwdriver set, but you can buy this tool separately. Identifying lengths is vital in electrical projects and tape measures are used for this purpose. There is a lot of variety in choosing a tape measure. The best option is to buy what works for you as long as it is in good condition. Now and then, an electrician has to drill holes into something. This could be during installation or disassembling of electrical components. A portable, handheld electric drill is suitable for such jobs. The drill need not be large, but small and effective is the right way to go. Some electricians find conventional ways to strip wires of their plastic coating without using a wire stripper. However, wire strippers are time and stress savers. They strip the wires neatly and without damage. These tools are efficient and a professional electrician should include one in his toolbox. There are several models of wire strippers. Having one of your choice is ideal, but you can invest in a few. Electrical projects most times have electrical technicians peeking into poorly lighted places. Light is important to work on electrical components, which is why a portable, bright torch is worth it. Electricians should own over one working lights at their disposal. Choose durable models that have less chance of leaving you helpless in the dark.